This example shows how to acquire bridge circuit voltage ratio data, then compute and plot strain values. To discover a device that supports bridge sensor measurements, click the name of the device in the list in the Command window, or access the device in the array returned by daq.getDevices command. For this example use National Instruments® CompactDAQ Chassis NI cDAQ-9178 and module NI 9219 with ID cDAQ1Mod7. This module is in slot 7 of the 'cDAQ-9178' chassis with the name 'cDAQ1'. Create a session, and add an analog input channel with the Bridge measurement type. There are two strain gauges connected to the NI 9219 in half bridge configuration. You must set the bridge mode according to the bridge circuit configuration and the nominal resistance to the specified value in the strain gauge data sheet. In this example, the strain gauges used are the SGD-3/350-LY13 linear strain gauges from Omega®. Set bridge mode to Half. Set nominal resistance of 350 ohm. Set the ADCTimingMode to 'HighSpeed'. 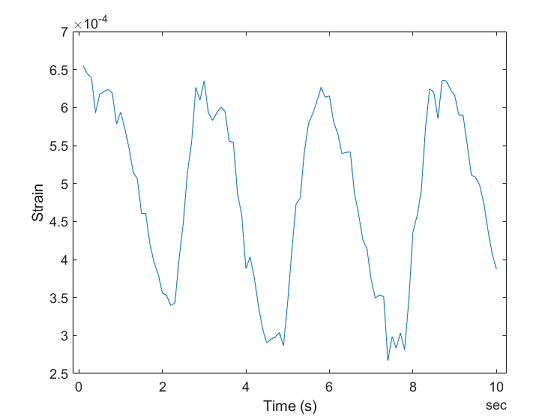 Set the data acquisition duration to 10 seconds. Will run for 10 seconds (100 scans) at 10 scans/second. Use startForeground to acquire data. The acquired data is the ratio of measured voltage to excitation voltage. Use this output to compute strain values. Your bridge configuration determines the conversion formula. where GF is gauge factor provided in sensor data sheet and Vr is the voltage ratio output as measured by your bridge channel. Note that we have assumed negligible lead wire resistance in this case. For the strain gauge used in this example the GF = 2.13.